While Lord Sri Venkateswara, also known as Lord Balaji and Lord Srinivasa, is undoubtedly the richest and the most powerful Hindu God in the world today, his five thousand year old sacred Tirumala Temple, located on the seven holy hills of Tirumala, is the most visited place of worship on the Earth. Although volumes have been written, in the last several centuries, about Lord Sri Venkateswara and the Tirumala Temple, there are still many miraculous facts that remain unknown to millions of his devotees.. 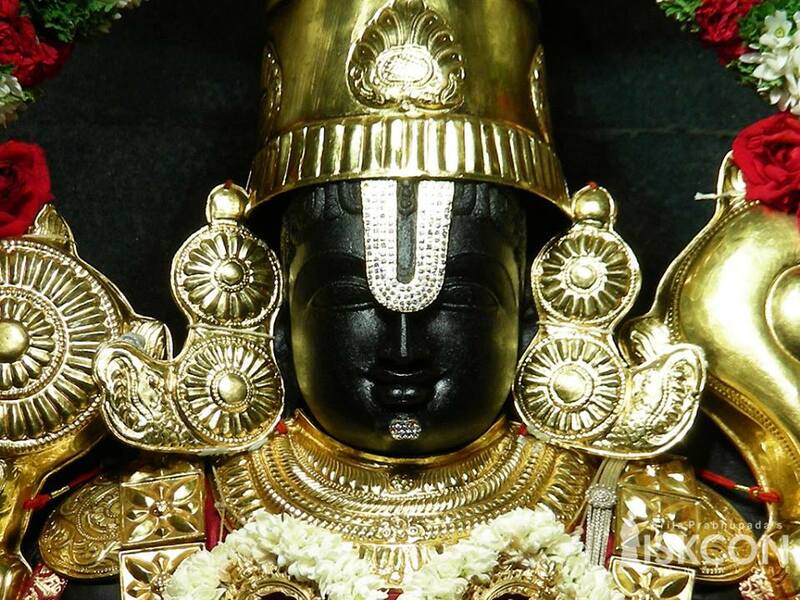 Here are those miraculous facts every devotee of Lord Venkateswara must know.. According to the Harivamsa Parva of the Mahabharatha, Bhagwan Sri Krishna, after the great war of the Kurukshethra between the Pandavas and the Kauravas had come to an end, obtained the form of a great lamp and had started travelling towards his celestial abode, the Vaikunta..
“My avatar as Krishna has now come to an end.. However, with the advent of Kali Yuga, the yuga purusha of Kali is going to wreak havoc on the Earth.. As a result, the good and the noble are going to suffer more than what they have suffered in the previous three yugas. Therefore, I need to stay on Earth for some more time to protect these nobles from the evil clutches of the Kali Yuga.. I will now be heading straight to the sacred Venkatachala hills on the Earth and would be staying there in a Temple, in the form of a stone idol (Salagrama Archa Murthy), until the end of the twenty eighth Kali yuga..
Hereafter, I will be called as Lord Venkateswara, the destroyer of sins.. In this form, I shall unconditionally rescue all those who come to seek refuge in me.. Those among you who wish to see me may come straight to the Venkatachala hills and find me there..
Saying so, Bhagwan Sri Krishna took a turn from the Vaikunta and traveled towards the Venkatachala hills and lay settled there.. This incident, as mentioned in the Hari vamsa parva of the Mahabharata, is very emphatically telling us that Lord Sri Venkateswara is none other than the other form of Bhagwan Sri Krishna. There is a natural stone arch, a geographical wonder, located at one kilometer distance to the North of the main Tirumala Temple just near the Chakra Teertham.. Also called the Sila Thoranam in native Telugu language, this stone arch, according to an extensive survey, conducted by the Geological Survey Of India scientists in 1980, is about 2.5 billion years old. Quite surprisingly, this natural stone arch that has the shape of a serpent hood, Sankha and Chakra (all the sacred elements associated with Lord Vishnu’s celestial body) gives the devotees an uunforgettable divine appearance. According to the legends of the Tirumala temple, Lord Venkateswara had first set His foot at the place where Sreevari Paadaalu is located today; then set on this stone arch and then at the place where the Moola Virat is standing today in the garbha griha of the Tirumala temple.. Although the age and the nature of the stone idol of Lord Venkateswara in Tirumala Temple are not clearly determined by anyone so far, there’s however one astonishing fact about this idol that still baffles many..
Any stone, to which camphor is regularly applied, is bound to crack over a period of time.. However, the stone idol of Lord Sri Venkateswara, to which pure camphor is being applied everyday, for several centuries now, doesn’t have any such cracks and is in fact just the same as it was when found thousands of years ago. A true miracle indeed which no scientist on Earth is still unable to crack..
Do you know who is the first person to have the darsan of Lord Sri Venkateswara in Tirumala temple everyday.. Believe me, it is a temple cowherd, called ‘Sannidhi Golla’ in Telugu language, who is the first person to enter the garbha griha of the Tirumala temple everyday and have the darsan of the holy lord, first. It is an age old tradition in the history of Tirumala temple according to which the cowherd, after the opening of the Bangaru Vakili, firstly steps inside the sanctum sanctorum area after which the archakas, the Jeeyangar and the paricharika follow him chanting the sacred Vedic hymns..
After entering the sanctum sanctorum, the Sannidhi Golla enters the Garbha Griha; pays his obeisance to the holy Lord there; and then lights up all the oil lamps – other than the two eternal oil lamps – that are there in front of the Moola Virat..
Later, the archakas and the Jeeyangar enter the Garbha Griha after which the curtains are brought down for a brief period.. But why a cowherd..??.. It was the greatest grand father of this cowherd who first viewed holy Lord Venkateswara, on the Earth, when the Lord emerged out of an anthill in which He hid Himself before appearing to humans on this planet. 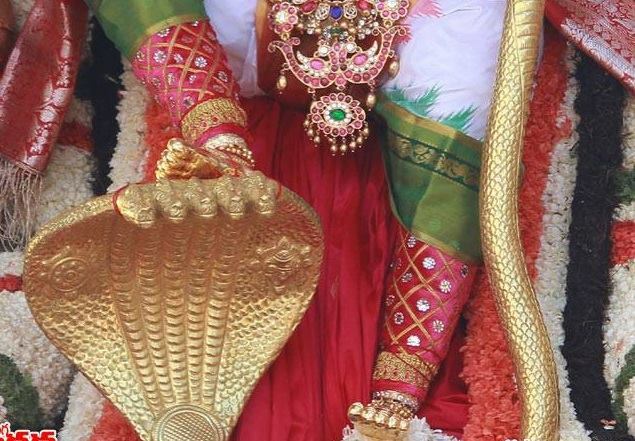 The celebration deities of Lord Malayappa Swamy, Sri Devi and Bhu Devi which are used during many of the festivals and events like Brahmotsavams on the Tirumala hills were actually found a few hundred years ago in a bush on the Venkatachala hills. 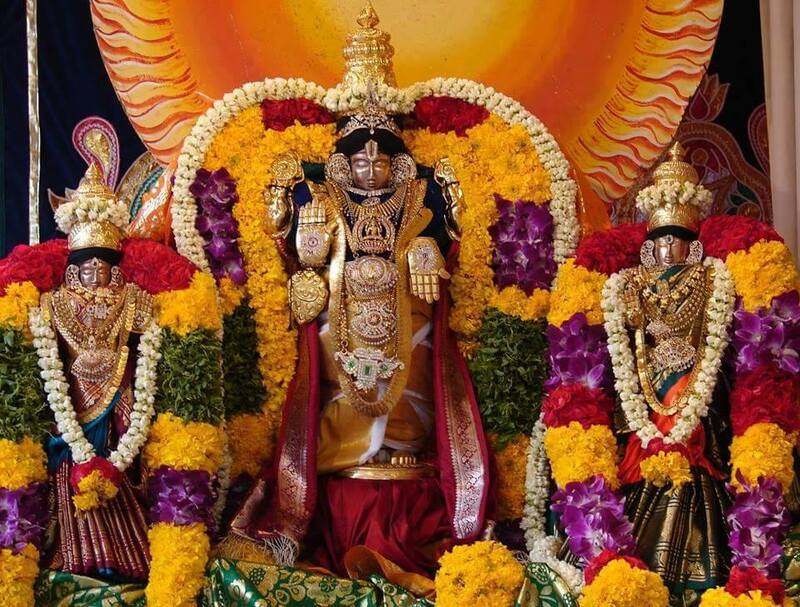 Lord Venkateswara Himself took a devotee into possession in the premises of the Tirumala Temple in the year 1339 and revealed this secret through him, about the deities hidden in the bushes, to His temple priests.. Please Click Here to read the complete story on this greatest secret in the history of Tirumala temple . Although difficult to believe but it again is a miraculous fact that thirty seven percent of the devotees who visit the Tirumala temple every year, are Muslims.. In fact, they are more devotional when on the sacred hills and never complain about anything whatsoever there. What is more surprising here is that it was due to the legacy of a Muslim devotee that a popular weekly arjitha seva, the ”Ashtadala Paada Padmaradhana” seva was introduced by TTD, in the Tirumala temple, during it’s Golden Jubilee year of 1982.. Please Click Here to read the full story..
As we all know the Tirumala hills are called the Venkatachala hills in Kali Yuga but according to the Bhavishyathoththara Purana they had different names in different yugas.. While they were called the ‘Vrishbhachala’ in Kritha yuga; and ‘Anjanachala’ in Trethayuga; they were called the ‘Seshachala’ in Dwapara yuga.. In addition to that, according to the Varaha purana, these hills have some more names depending on the qualities they have and the benefits they offer to the devotees.. The following are the names with reasons why they are so called. B. Gnanachalam : Because they offer knowledge and wisdom to all those who offer prayers on this sacred hills..
D. Pushkaradri : Because of the number of beautiful ponds and lakes on these hills including the one in which it is believed Goddess Saraswathi is residing..
E. Vrishadri : Vrisha means Hindu God of death, Lord Yama.. Since Yama performed penance on these hills and obtained many boons from Lord Srinivasa, these hills are also called Vrishadri hills. F. Narayanadri : A great Brahmin by name Narayan performed penance on these hills and had viewed Lord Venkateswara and both His consorts, Sri Devi and Bhudevi in their real forms.. Therefore these hills are also called the Narayanadri hills. There’s also no truth in the fact, again circulating everywhere, that “there’s a forbidden village, twenty three kilometers away from the Tirumala Temple, from where specially grown flowers are brought everyday and used by the Temple priests in nithya kainkaryams (daily sevas) to Sri Varu..”..
It’s all rubbish and there’s no such village existing anywhere in and around the Tirumala Temple.. Lord Sri Venkateswara is a big fan of Lotuses and Basil leaves and only garlands made with these leaves and flowers are used during the daily sevas. Again there’s no truth in the fact that there’s a well inside the Garbha Griha of the Tirumala temple exactly behind the Moola Virat and it is used for dumping the removed flowers and wastage from the Garbha Griha..
There’s no such well behind the idol except a small altar which the priests use, to stand and decorate the Moola Virat. For a longtime, I have been thinking about writing and publishing this article but for various reasons could not so far do it.. This entire article is based on an enormous study that I have conducted, for the last several months, on various aspects related to many topics on Lord Sri Venkateswara and the Tirumala temple.. Some of you may disagree with some of the facts I have mentioned here in this article but please note that I have only written about pieces that I have found in some of the most authentic literary masterpieces created by many great geniuses. I know am just an ordinary pilgrim and derive pleasure in singing praises of Him and share, whatever little I know about Him with the reading world.. Hare Srinivasa..